They say breakfast is the most important meal for a reason, so we began our day with a small feast that included traditional Greek yogurt with honey, fresh fruit and pastries at the Central Hotel. Our first destination was Acropolis Hill and I couldn’t contain my excitement after seeing it lit up from the adjacent Mars Hill the night before. We arrived early to beat the heat and the crowds (both of which soared faster than you could say Hades) and headed straight to the Parthenon, the iconic temple dedicated to the city’s patroness Athena. While much of one side was shrouded with scaffolding the ruins in repair were nevertheless impressive. Aside from the sweltering heat, it was a surreal moment to be standing face to face with one of the most important structures of Western civilization. As we rounded each side of the Parthenon, walking carefully over the slick marble from centuries for wear and tear, I was glad to have visited the Acropolis Museum the previous afternoon to help fill in the blanks (literally) of what the Parthenon looked like at the peak of its glory. Equally as impressive was the Erechtheion with its beautiful maiden-column porch (5 of the 6 original statues are also on display at the museum) and the nearby olive tree that was planted in honor of Athena’s first gift to the city. In Rome you have the Colosseum and Forum and in Athens you have the Acropolis and Agora, so naturally that was our next stop. It’s also one of the 7 sites covered by the Acropolis combo ticket, so visiting the Ancient Agora is a no brainer. To my surprise, very little remains of the once-lively 6th century BC political, commercial and social center of Athens, requiring a bit more imagination. We started by walking down the Panathenaic Way, the processional route leading to Acropolis Hill up above, before seeking shelter from the sun. We found relief under the portico of the Stoa of Attalos, a reconstruction of the two-story shopping center that now houses a small museum of ancient objects ranging from sculptures to coins and an ancient “voting machine”. Another highlight was climbing to the well-preserved Temple of Hephaestus (much more so than the Parthenon), enjoying the view of the Agora below and the Acropolis and Mars Hill in the distance. After leaving the Agora we headed to Monastiraki Square, a great area for both shopping and a casual lunch of souvlaki or other snacks (and for me a much-needed frappé to cool off). Also on my list was Melissinos, a family-run shop that has been making custom leather sandals for 3 generations. It was a fun experience trying on the different styles, some of which are named after Melissinos’ famous customers – Sophia Loren, John Lennon and Jackie Onassis – and in the end I went with the “Laconian” lace up sandal since I wanted something that I couldn’t necessarily buy at home. While my sandals were being made we visited the Central Market (primarily fresh fish and meat, every part and every way possible) and did a little more shopping in the surrounding area before returning to the Melissinos. We also scoped out some of the restaurants in the nearby Psirri neighborhood where we would return for dinner later that night. 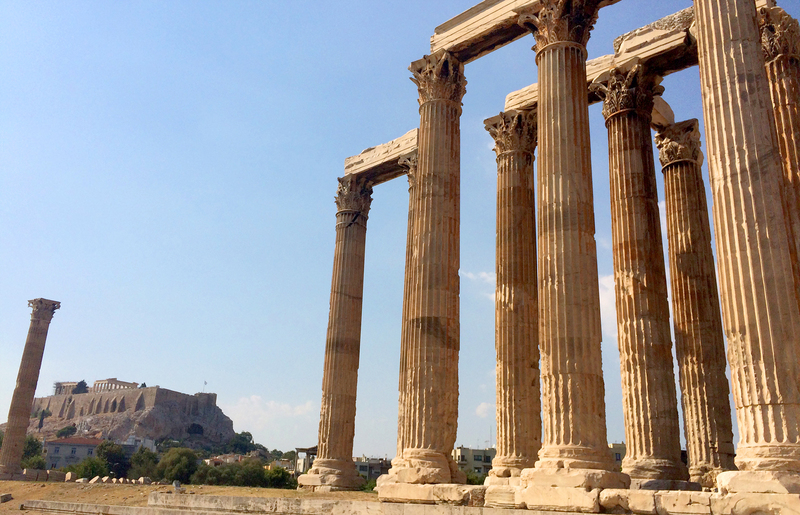 Sandals in tow, we headed across town to visit more of Athens’ “classical” treasures. First up was the Temple of Olympian Zeus (also covered by the Acropolis ticket), dedicated to the king of the Olympian gods himself. It was once one of the largest temples in Greece, but today only 15 of the original 104 Corinthian columns remain standing, with one other toppled over like a row of dominos. Next was the Panathenaic Stadium, the venue that played host to the first modern Olympics in 1896. Reconstructed on the site of the former ancient Greek stadium used in the Panathenaic Games, it’s the only stadium in the world built entirely from marble (its official name Kallimármaro means “beautifully marbled”) with seating for 45,000 spectators. The stadium was once again in the spotlight during the 2004 Olympics in Athens, serving as the backdrop for the archery competition and marathon finish. It’s also the place from which the Olympic Flame is delivered to all of the Olympic Games. Had it not been 100+ degrees outside, I would have gladly ran a lap or two around the stadium because, why not? Afterwards we cut through the 40-acre National Gardens on our way to Syntagma Square to catch the changing of the guard. The ceremony takes place every hour on the hour in front of the Greek Parliament building and lasts for about 30 minutes (with a larger, more elaborate ceremony on Sundays at 11:00am). It’s quite the spectacle to watch as the guards called “Evzones” – clad in traditional dress, notably pom-pom topped shoes and a tasseled red had – participate in this formal transition of shifts to watch over the Tomb of the Unknown Soldier. Like the changing of the guard in London at Buckingham Palace, it’s something you should try to observe when in Athens. As we made our way back to our hotel, we ended our day with some wandering and window shopping in the Plaka. This neighborhood is heart of Athens, exuding both old-world charm and new-age offerings, a souvenir shopper’s delight – olive oil products, spices, worry beads, jewelry, sandals and more. Despite the touristy vibe it wasn’t “junky”, and I couldn’t get over how friendly the shopkeepers were wherever we entered. And how beautiful the buildings looked bathed in the golden light of the late afternoon sun. Yes! Just as hot and lacking in shade as the Roman Forum. I hope you make it there someday Suzette! I love Athens too. Will be there at the end of the month, cannot wait! Great photos. Thank you! I hope you have a wonderful trip!! !